How much speed do you need! The GPS_6 takes medium wind efficiency to a higher level. 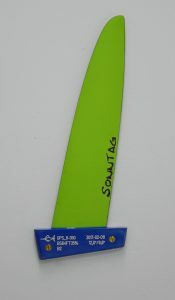 It is not a lightwind fin, performance is below average in lightwind. I didn't test it in extreme high wind, however I believe the fin is best for 20~35kn of wind. Why is it fast? I believe there is one reason, from 30kn of 55 km/h this fin can take more pressure/power compared to others. I definitly felt it during testing and swapping this fin for a normal (freeride) fin. The power doesn't result in extra drag, however you have to go 30kn to benefit. If there isn't much space (short flat course) a fin with more acceleration performance between 30~55 km/h will be easier. But the GPS_6 is very quick if you are able to go 55 km/h into a gust and there is enough space to do a 10 second run from there. The power can be a bit overwhelming at times, I don't use the fin as allrounder. However on certain days you will need something like this to reach the highest speed on your GPS.